UNKNOWN CASTLE - DECLUE CASTLE ? - IRON HILL CASTLE ? 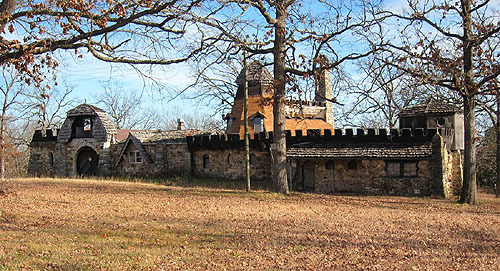 Are you aware of the castle in Franklin Co., Mo.? I used to live on Highway AH Just off of I-44 during the early 1990's. I remember driving on a dirt road, I believe it was Iron Hill Road between Hwy AH and Hwy TT. This is east of St. Clair. I was told the man who owned the property was building it completely by himself. I don't remember his first name but his last name is DeClue. It's a really cool old house that looks castle like and I wish I knew more about it. My husband said no one had lived there for a long time, but at one time it was up for sale. However, I still can't find anyone who knows about it. I took a few pictures of it. Here is a picture I took today. Hello, my name is Rilee Frank DeClue. I came across your website and noticed a castle in St. Clair Missouri. After reading the article/email attached to the photo, I decided to email you to perhaps shed a little light on the mystery surrounding this castle in rural Missouri. This castle was actually built by my late Grandfather Frank DeClue and was the childhood home to my father Ronald DeClue and his three siblings. My Grandfather built this castle by himself, by hand, having drug every stone home on a trailer bed from some creek, river, or quarry. Sadly, after the passing of my Grandmother Alpha DeClue in the early 80's, my Grandfather stopped working on the house leaving the interior not completely finished. After his passing 4 years ago, my Uncle Frank Jr. (Dennis) DeClue moved in as caretaker. The castle is currently up for sale. I actually live across from the Iron Hill Castle in Union, Mo. There is a Facebook group called Saving Iron Hill Castle. It is run by the current owners who are I believe still in the process of renovations to fix up the outside as well as the inside of the castle. I figured I would let you know of the group that way you can check it out and see the progress they have made on the castle. CASTLEFINDFR NOTE -- A few years ago, my wife and I stopped and saw this castle on our way to visit Old Cross Castle. I am very pleased to see that someone is going to fix up this great building. At ths time we saw it, it was vacant and looked run down. I wish all the luck to those who are trying to save it. Photo courtsy of Matt Schneider.